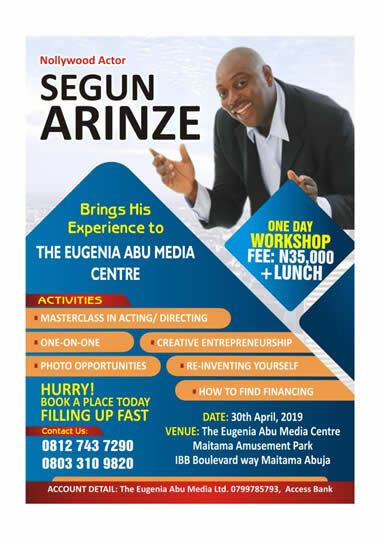 Award winning actor Segun Arinze brings his wealth of knowledge and experience to The Eugenia Abu Media Centre on April 30th, 2019. Call to Register Now!!! 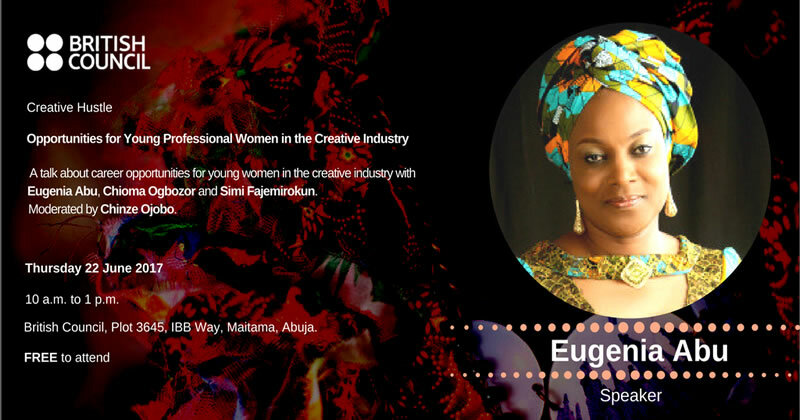 A talk about career opportunites for young women in the creative industry with Eugenia Abu, Chioma Ogbozor and Simi Fajemirokun. Role modeling and mentoring have been identified as critical tools towards nurturing Nigerian future leaders who will make the nation proud. 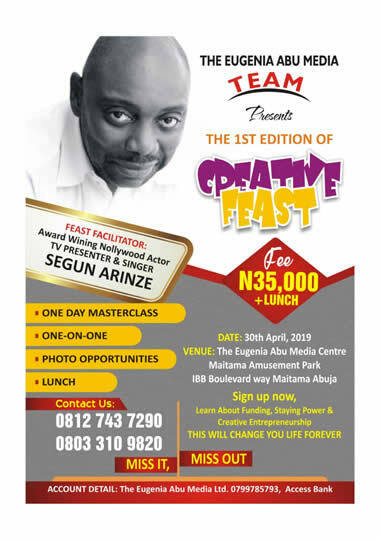 This was the opinion expressed by friends and well-wishers of ace broadcaster and creative writer Eugenia Abu as she turns fifty and a number of activities including a dinner in her honour were used to drive home the message. The day belonged to Eugenia Abu at the Sheu Musa Yar adua centre where friends and well-wishers gathered to celebrate her 50th birthday at a public lecture titled BEING THE BEST YOU CAN BE. Obviously a lot of people gathered to celebrate and had so much to say but not one to be outwitted, she showed just why her skills as a broadcaster and mentor to Nigeria's younger generation continues to endear her to many. The evening provided opportunity to make merry, sway to some old tunes, sample out the latest fashion trends and listen to some truth especially as it relates to preparing another generation that would take over from the celebrant. Many at the dinner party lamented the near absence of a mentorship tradition that had seen many young people treading the wrong path and ending up as tools in the hands of mischief makers. The evening still belonged to Eugenia Abu for her accolades poured. Apart from making a mark in broadcast journalism, Eugenia Abu has continued to inspire the younger generation through her mentoring activities evident in her creative writing class for under fifteen children. She is also a poet, columnist and motivational speaker. The Treasured Writers (TTW) is an annual summer writing workshop for children between ages 7 to 14. 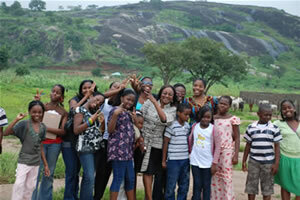 It lasts between 6 to 7 days and has events like picnics, skills acquisition exercises and prize giving ceremonies. You can contact us for details of the next edition. 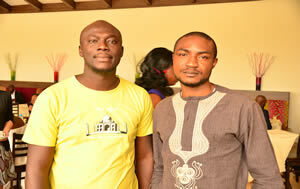 The Eugenia Abu Centre hosted a breakfast in honour of the 2013 Caine Prize shortlisted writers. All four of the five shorlisted writers were from Nigeria with two of them based in Abuja. Abubakar Adam Ibrahim and El-Nathan John. The event was hosted at the Blucabana, Abuja. Ace broadcaster and writer, Mrs. Eugenia Abu was Thursday night voted Nigeria's Most Inspiring Woman at the Vlisco 'Be Your Dream' Awards ceremony held in Abuja. 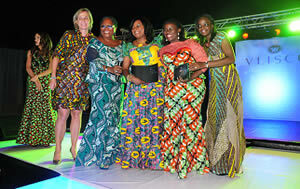 The event was part of the fabric company's celebration of Women's Month 2013. Mrs. Abu was the favourite amongst voters from a well-heeled list that included renowned actress Mrs. Joke Silva; broadcaster and politician Hon. Abike Dabiri-Erewa; celebrated writer, Miss Chimamanda Adichie ; and former head of the MDG Office and development expert, Hajia Amina Az-Zubair. Yvonne Chioke, Regional Representative of Vlisco, awarded the grand prize to Mrs. Abu which includes a trip to Holland (and a visit to the Vlisco factory). All the other nominees were equally honoured. The event held at the International Conference Centre (ICC) and was hosted by Eku Edewor of 53 Extra and comedian Dr. Success Ayuba. Also present was Zeera Banu, ECOWAS Queen 2012. TFK Couture provided the designs for the runway show. In August 2013, the Award winners of Congo, Benin, Ghana, Niger, Nigeria (Eugenia Abu), Ivory Coast and Togo arrived in the Netherlands for a 3-day visit. This inspirational trip, full of cultural and educational activities, was part of the first prize. The ladies, also known as our Brand Ambassadors 2013, will provide the knowledge and experiences they gain during their visit to The Netherlands to women in their homeland and abroad. 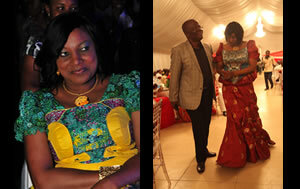 Eugenia Abu, for 17 years a news anchor on national television, is one of Nigeria's most recognisable faces. She now divides her time between writing books - poetry, fiction and non-fiction - and teaching and mentoring.. In the Blink of an Eye is the collection of essays that won her the ANA/NDCC Flora Nwapa prize in 2008. Her collection of poems, Don't look at me like that, also garnered much acclaim. Eugenia Abu recently visited NAI, Sweden to talk about literature and share her views on her long career in the mass media. On top of writing books, teaching and mentoring, you also have weekly columns in two national newspapers. How do you find the time? Talking about your literary boot-camp for children, in the age of text messaging and social media, are young people in Nigeria still interested in traditional forms of reading and writing? Nigeria has produced a number of top international writers in recent years. Are there elements in Nigerian culture that make your country such fertile ground for literary talent? You also have a passion for mentorship, something you have described as a fast-track to building human capacity in Africa. Could you say something about your philosophy regarding mentorship? Who do you turn to yourself when you need guidance?